It is really going to happen! We talked about this for YEARS, and now we are finally going to see it come to fruition. Kate Loudon and I have known each other for a long time. It was kind of inevitable that two women who were part of the leadership of the Entomological Society of America’s Section B, now the Physiology Biochemistry and Toxicology (PBT) section, would become friends. We are actually from THAT era where female leadership in the ESA was a rarity (not anymore!). Since we both have an interest in insect physiology (broadly) and biomechanics (specifically) we started talking about organizing a bioinspiration symposium. Fundamental insect biomechanics studies have inspired technologies for some time now. For about 5 years I have been teaching courses on bioinspiration and I use Kate’s research on bed bug-killing materials as an example of innovations that can be inspired by nature and benefit society. So the match seemed natural. Also, we really like each other and would use any excuse to collaborate on something. It took a while but we managed to put together an awesome symposium with prestigious speakers on the biggest entomological stage ever; the 2016 XXV International Congress of Entomology to be held in Orlando, FL (Sept 25th-30th). We are so thrilled about the line-up. There is a great variety of speakers (topics, nationality, ethnicity, gender) and we can’t wait for them to interact with each other and other interested entomologists. Some of our speakers have never been to an entomological meeting. We expect to get them hooked, or at least speak well of us entomologists once they are back at their home institutions. We hope that as a result of this symposium new collaborations will develop, be it to delve into new research questions or to explore educational avenues. Let me first introduce you to the speakers. Hopefully as the symposium draws closer I can share a little bit more about the topics and speakers in follow-up posts. Our first speaker will be Dr. Robert Wood who is the Charles River Professor of Engineering and Applied Sciences in the Harvard John A. Paulson School of Engineering and Applied Sciences. Prof. Wood is also a founding core faculty member of the Wyss Institute for Biologically Inspired Engineering, a power-house in the field of bioinspiration. The Wood lab is probably most famous among entomologists for their work on robobee – a miniature flying, and now also sensing, robot inspired by biology. The next speaker will be Chen Li from Johns Hopkins University. Prof. Li coined his own research topic: terradynamics. Similar to how aero- and hydrodynamic principles have shaped our knowledge about animal locomotion in air and water it is Prof Li’s goal to better understand animal locomotion on complex (always shifting) terrains, thus his creation of the terradymics lab at JHU. Cockroaches feature prominently in his research. Next we switch from robotics to bioinspired materials. Kate (Dr. Catherine Loudon, University of California at Irvine) will share her work on how small structures on bean leaves kill bed bugs and how these structures (and their special characteristics) have spurred interest in the development of physical insecticidal bioinspired materials. Faithful readers of this blog will know by now how enamored I am by the insect cuticle. I am therefore glad that we will have Dr. Stevin Gehrke (Fred Kurata Memorial Professor of Chemical Engineering at the University of Kansas) talk about the physical properties of beetle elytral cuticle and why this type of biomaterial may have many possible applications. Next I will discuss a relatively new project from my lab at the University of Illinois at Urbana-Champaign in collaboration with Dr. Nenad Miljkovic from Illinois’s Mechanical Science and Engineering Department and Dr. Donald Cropek who is a chemist from the U.S. Army Corps of Engineers. Over the past few months we have initiated a comparative study of native Illinois cicadas’s wings to determine physical and chemical attributes that make the wings have (super)hydrophobic, self-cleaning and maybe even antimicrobial characteristics. This collaboration has been really fun and I have learned about a lot of new techniques and I hope to share some of my excitement with the symposium’s audience (Bouncing water droplets anyone?!!!!). Another interesting biological material is, of course, spider silk. Dr. Crystal Chaw from Dr. Cheryl Hayashi‘s lab at the University of California at Riverside will explain how studies on the evolution of spider silk have helped in the engineering of artificial silk production. From biological materials we next move to different types of flow in insects. First Hodjat Pendar from Prof Jake Socha’s lab (Virginia Tech) will be talking about how the insect’s tracheal system (which is actually linked to other physiological systems) can serve as inspiration for novel flow control. It is a fascinating topic which I have touched upon previously in a blog post. Flow sensing at a small scale is definitely a topic that is of interest to engineers. And it is something that insects do very well. Dr. Jérôme Casas from the University of Tours (France) will present some of the work he has been doing with Dr. Gijs Krijnen (University of Twente, The Netherlands) on the fluid dynamics of olfaction in insects. Another amazing sensor found in insects is the IR sensor in pyrophilous beetles such as in the genus Melanophila. Will we ever be able to engineer an IR sensor as sophisticated as the ones found in beetles? Dr. Helmut Schmitz (Institute of Zoology of the University of Bonn) will share his work to explain how an understanding of the active amplification mechanism seen in the beetle’s IR sensor might help bring us closer to a robust and sensitive bioinspired IR sensor. IR organ of Melanophila acuminata. Schmitz & Bousack (2012) PLoS ONE 7(5): e37627. At this point in the symposium we are shifting gears just a little bit to talk about how to actually DO bioinspired design, and how can we best teach our students to come up with successful bioinspired designs. Most people when they first hear about bioinspiration or biomimicry they immediately think this line of thinking makes total sense. Biologists want to contribute and feel even more justified to delve into fundamental biological questions. Engineers are happy to add bioinspiration into their imaginary toolbox. But for bioinspiration to be successful, to actually have as an end result a bioinspired technology that is based on real biological data, biologists and engineers have to work together. And that is not always so straightforward (Writes the entomologist who has been married to a mechanical engineer for 20+ years. Trust me, it is not straightforward.). Prof. Ashok Goel (Georgia Tech, Co-Director of the Center for Biologically Inspired Design. will discuss some of the cognitive challenges that he has encountered when working with collaborators and students on biologically inspired design projects. What he has learned about how engineers and biologists approach certain problems is fascinating. The symposium will again switch topics somewhat by next delving into social insect behavior. First up will be Dr. Ted Pavlic (Arizona State University, Associate Director for Research at The Biomimicry Center at ASU) who will talk about how social insects make group decisions and how that knowledge can be transferred to create smart and adaptive teams of robots. Eciton hamatum workers on the trail, Jatun Sacha reserve, Napo Ecuador. Alexander Wild. We will end the symposium with another social insect talk, this one by Dr. Deborah Gordon (Stanford University). Prof. Gordon will talk about her research on collective behavior in ants and how they have influenced engineered networks. Kate and I hope you can join us for our symposium, either in person or virtually via Twitter or Instagram (we will use hashtag #ICE2016BioI and #ICE2016) and follow-up blog posts. Feel free to use Twitter to ask questions of the speakers (@Cotesia1). “See” you on the 29th! This post is part of a series on the insect cuticle as a biological material that can inspire novel engineered materials. The characteristics of the cuticle, setting it apart from most synthetic/engineered materials, will be discussed in this series. The introduction to the series can be found here. Cellular and acellular layers make up the insect cuticle. 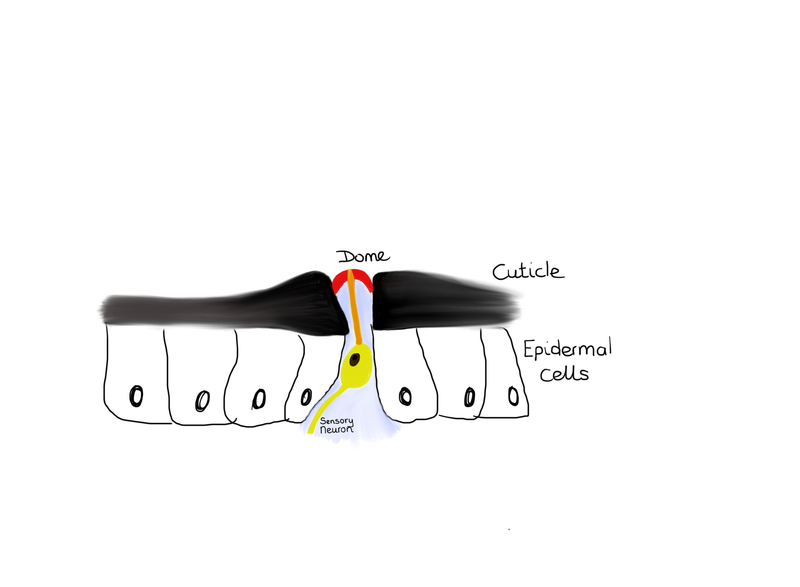 With the most interior layer being comprised of living epidermal cells that secret the outside layers, which then completely cover the insect – even some of the interior surfaces such as the trachea, foregut and hindgut – are lined with cuticle. 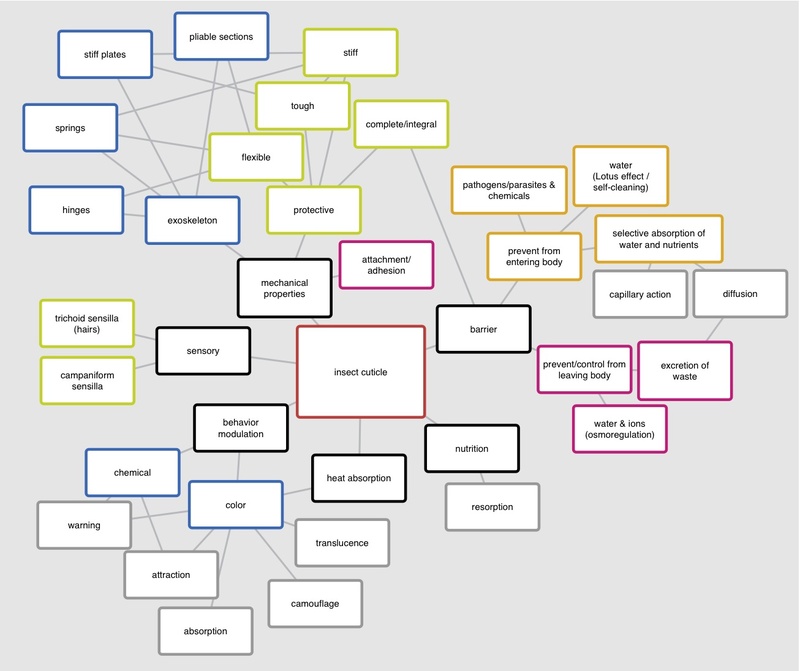 (The hierarchical characteristics of these layers will be discussed in the next post.). One of the characteristics that makes the insect cuticle, an “inspirational” biological material is its multi-functionality – something that is rarely seen in engineered materials. Living materials, including the insect cuticle, often exhibit novel properties that are difficult to incorporate (all at once) into engineered materials. Unique physical and chemical interactions of the biomolecules that make up the cuticle (building blocks) at the nanometer scale convey characteristics such as high strength, energy absorption, and flexibility. Currently multi-functionality in engineered materials is limited to different functions due to a hybrid of several distinct phases the material can attain. Insect Cuticle Functions – probably not complete – click on diagram to enlarge. The insect’s exoskeleton/cuticle/integument is doing the functions of both our skin and our bones. The cuticle completely covers the insect (~armored skin), while at the same time serving as a supportive skeleton (~bones). The protective covering creates a barrier. Precious water and ions are prevented from freely moving outward, while pathogens, parasites and dangerous chemicals are prevented from moving inward. This function is not at all trivial for insects. Since insects are relatively small they present a large surface area to the outside environment so that loss of water is a greater problem than it is for larger animals such as mammals. The insect’s exoskeleton gives the insect structure and form. And over an individual’s lifetime that form can change. In the case of holometabolous insects, such as flies, wasps, bees, beetles, butterflies and moths, this form change is striking. As an immature caterpillar a moth has a cuticle that stretches and is relatively soft, as a pupa the same individual (using the same building blocks, or biomolecules) has a cuticle that is extremely tough and does not change shape easily. 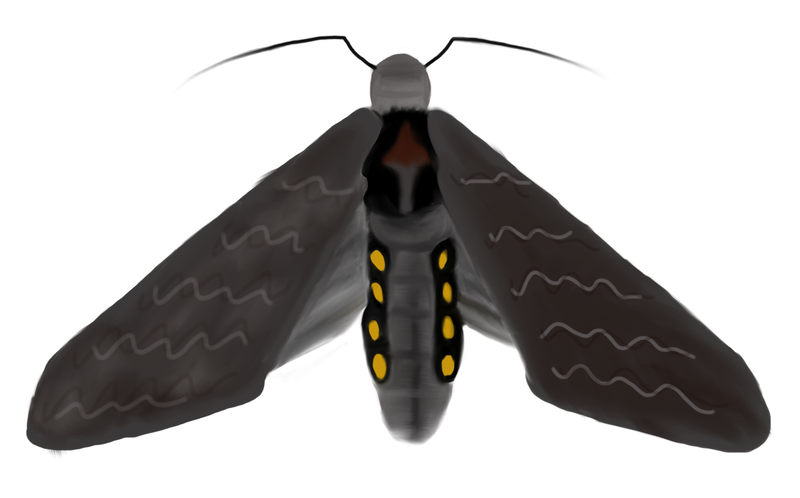 Then as an adult moth the cuticle, including the wings, has yet other features that make the insect successful. The change in structure and form seen in holometabolous insects, and to some extend the growth strategies employed by ametabolous and hemimetabolous insects, enables the animal to exploit different habitats and diets – even during its lifetime. This is one of the most striking things about the cuticle. During the separate life stages the cuticle has different functions, it therefore has distinct characteristics and appearance. Yet, the biomolecules that make up the cuticle are pretty much the same, and one individual can synthesize all these seemingly very different types of cuticle. How different is the cuticle from life stage to life stage? I asked family, friends and colleagues to describe, in non-scientific terms, what the cuticle of each form of the hornworm (=moth) feels like. Here are their responses. Soft, rubbery, squishy, velvety, muscular, cold. Feels like pleather, like a writhing rubber pickle, like play dough that I rolled in my hands to make a snake. Hard, smooth, leathery, acrylic, slick. Feels weird & dead. Fuzzy, hairy, soft. Feels like perfumed talc from my grandmother’s vanity. Holding it will probably feel like a fluttering beakless bird but since I haven’t held a fluttering bird, with or without a beak, I can’t be sure. The rigidity that the exoskeleton exhibits makes it possible that insects can make rather precise muscle movements since those are due to the insertion of muscles to the integument wall. It is often the cuticle that has important biomechanical features that enables an insect to run, jump, dig, fly or swim. These precise movements are also essential for respiration (creating flow of air in and out of the tracheal system), food manipulation, excretion and osmoregulation. Maybe surprisingly a rigid integument is not necessarily limiting awareness of the surroundings. The cuticle has been modified in many insects into structures that can sense most of the modalities that we can sense with our skin. 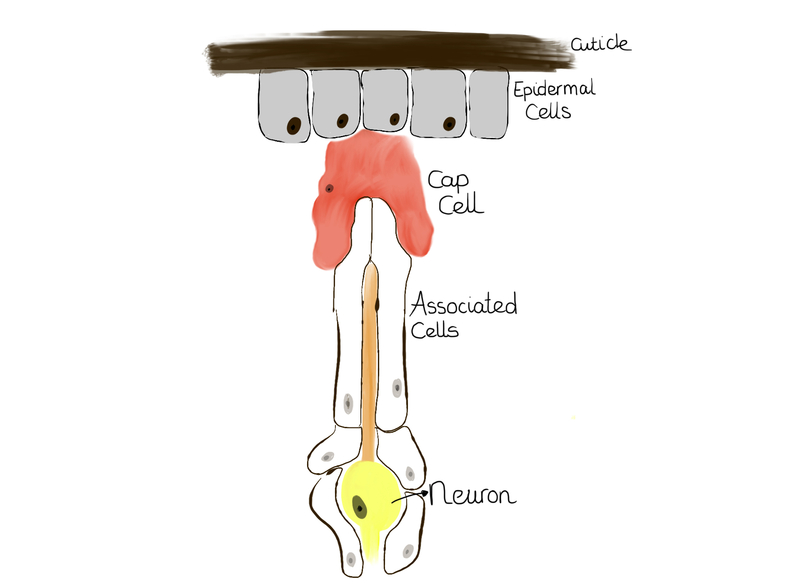 Some examples are the trichoid sensilla, the campaniform sensilla and chordotonal organs. Note that all three of these sensors use the cuticle as an integral part of their structure. 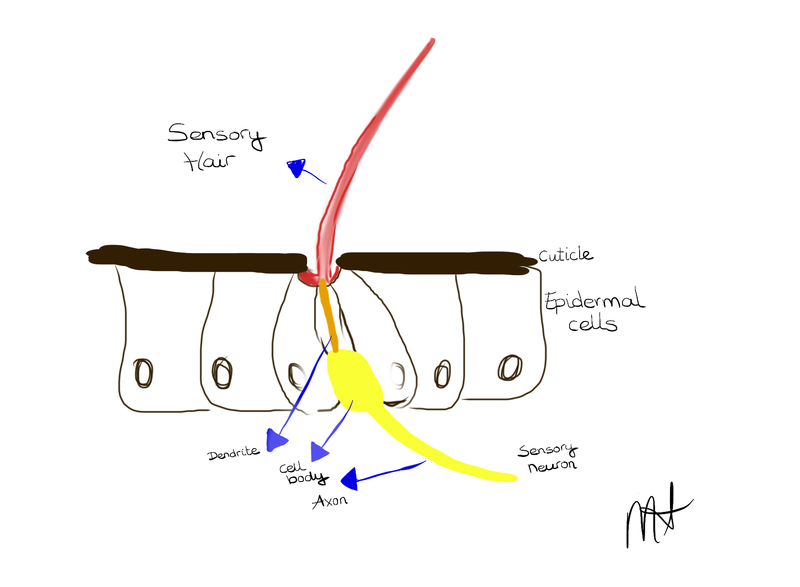 The chordotonal organ is a stretch receptor that senses to what degree the cuticle is being deformed. This deformation can then give information about movement of body parts, gravity (proprioception) and vibrations of the surrounding air (hearing). The single layer of epidermal cells that secretes the cuticle also secretes and deposits within or on the cuticle hydrocarbons that are involved in behavioral sequences that are important in recognition and mating. Pheromones and pigments are also deposited. The cuticle may also have modified structures that are important in mating or other behavioral processes – such as bumps, hairs, nano-scale structures that create structural colors. By further studying the insect cuticle it is my hope that new materials can be created, using similar “manufacturing” steps as employed by insects, that can provide increased function through integrated or further-integrated systems. Insects do it, we should too. Next: the structural hierarchy of the insect cuticle. #EntSoc13 – One for the record books.